Going back as far as the 18th century, the English have been lauded by visitors for their clean selves, homes, streets and towns. Buckets and basins full of hot water and suds kept everything and everyone (including pets) nearly spotless and fresh. In their latest two "perfumes," Blasted Bloom and Blasted Heath, Penhaligon's has taken things too far, producing fragrances with the heart (notes) of cleaning products. "Blasted" can mean 'drunk' or 'withered' or 'damned.' I think of Blasted Bloom and Blasted Health as perfumes (sand)'blasted' into banality and cleanliness with all interesting and vibrant bits of all notes they contain deleted — woods, leaves, tobacco, flowers, patchouli, etc. Aren't clean perfumes, drenched with white musks, on the way out? Perhaps Penhaligon's is just waaaay late to the Clean Party. Don't Blasted Heath's notes sound rich? Intriguing? Well...they aren't. What I smell right out of the bottle is either straight-up Cashmeran or Firmenich's ClearwoodTM — a scrubbed-clean, artificial-smelling 'patchouli'. I also smell aquatics and 'fresh' vetiver, but that's about it. Blasted Heath fades away rapidly, but does supply one un-clean note — a rancid nut odor in the dry down (that's a fruit or seed note to those of you with 'dirty' minds)! I recently came across a multi-purpose cleaner at Whole Foods that smells just like Blasted Heath; at $18 dollars a bottle I passed, so imagine how I feel about Blasted Heath's $135-170 costs; at those prices, we deserve bigger bows and glass caps! Blasted Bloom is even worse than Blasted Heath. Conjure up an accord of crap rose mixed with a toddler's heavily sugared, morning juice cocktail. Blasted Bloom's berries are "wild" indeed...like no berry you'll encounter in nature. As in Blasted Heath, we experience more aquatics and ClearwoodTM mixing with lots of white/clean/laundry-room musks. Wearing Blasted Bloom made me queasy and also made me reconsider my earlier definitions of "blasted"...in this case I'll go with "enough of this blasted (i.e., damned) fragrance!!" Blasted Bloom is not as good as the Mrs. Meyer's Geranium room spray I use when a litter box emergency strikes; in the extreme dry down, Blasted Bloom smells like shampoo. Smelling these perfumes makes me REALLY afraid to try the current version of my favorite Penhaligon's fragrance: Hammam Bouquet. Penhaligon's Blasted Bloom and Blasted Heath Eaux de Parfum, both developed by perfumer Alberto Morillas, are available in 50 ml ($135) and 100 ml ($170). 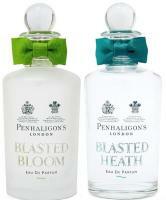 For buying information, see the listing for Penhaligon's under Perfume Houses. Note: top images [altered] via Wikimedia Commons. It took me a moment to realize that those cleaning product bottles were a joke. I just assumed that the Moschino Fresh bottle had sparked a trend! I thought the same–or that maybe these WERE cleaning products (though from the review it sounds like they wouldn’t even be good for cleaning). Doc…Penhaligon’s cleaning products; ain’t gonna happen! We’ve been exposed to so much weirdness in packaging and ad copy that those bottles being jokes never crossed my mind. I thought they were ugly, but never batted an eye. Lucy…guess I picked out those bottles wisely? Ari…ha…yes, assumed that would happen. Thes concept for these sound as depressing as perfumes called ‘Flight Delay’ or ‘Traffic Jam’ or even ‘Car Sick’. Maybe something to give the maid or butler to show you care? Great review though…thanks! Kanuka: you’re welcome, but I was hoping for so much more from these. I had samples and tried both. I actually preferred BB to BH, as the Heath smelled more like cleaning product to me. BB, though, had an atmospheric moment in the beginning, reminding me of a cool, grey, morning with damp rocks and vegetation in muted roses and greens. After a while, the aquatic business did make me queasy. Phew, so it wasn’t just me who thought they smelled like cheap cleaners. I smelled them first time when I was in Florence for Pitti Fragranze and I had to scrub them off. So synthetic and meh. Lucas, ‘meh’ is the right word; I had to scrub off BB, too. “Blasted heath” was one of HP Lovecraft’s phrases. He used it in “The Color Out of Space” describing a place where, “The trees grew too thickly, and their trunks were too big for any healthy New England wood. There was too much silence in the dim alleys between them, and the floor was too soft with the dank moss and mattings of infinite years of decay.” I think I could appreciate a fragrance inspired by this, but Blasted Heath sounds like it was inspired by Woolite. Rick…I bet there is a Woolite that smells similar these days! Has something happened with their company that has caused them to start cleaning everything up? Lucy…well, almost all perfume houses have reformulated their perfumes; I’ve not smelled a recent bottle of Hammam Bouquet and almost don’t want to. this sounds both horrific & unfortunate. could it be the result of their recent acquisition by puig ?? Ugh, I got a sample of Blasted Bloom recently too and it was … nearly revolting. It was disappointing. Sun Mi: I have really low expectations these days and still I was disappointed. this review cracked me up, so thanks! Honestly I get a whiff of cleaning product in most of Penhaligon’s perfumes… in particular that horrible Bluebell fragrance. Between, oy, have not smelled Bluebell in ages! Wise decision, Kevin! If you care about your equanimity, you should never smell the current version of your favorite perfumes. I guess that’s more of a hazard for those who spray abundantly and limit themselves to fewer than 100 bottles. I strongly recommend acquiring more bottles. Noz: I really should have bought several vintage bottles when I could have! Hamamelis…and that was a quick chop. At first I really though that Penhaligon’s had put this juice in those bottles. The review is fun, as always, the fragrances apparently not as much. I’ve only tried two P’s: Amaranthine which I thought was good, but didn’t love, and Ostare, which I adore. I’ll not bother to try these then. Austenfan…act fast I guess if you want some Ostara! Disappointed that penhaligons actually bothered with this idea and went ahead with these fragrances.